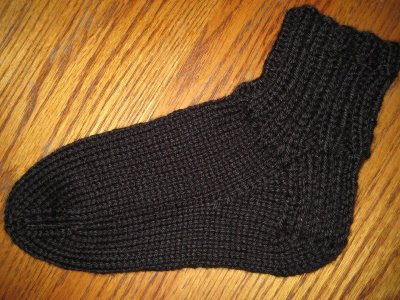 I actually knitted a sock; I can't believe it. There are a few holes in my knitting, but I've decided to leave well enough alone. Now that I have actually gone through the steps to knit a sock, I will pull out my knitting book and see if I can identify my mistakes. 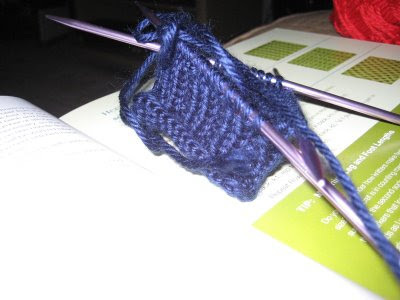 My method - a single sock on double-pointed needles - is not really useful if I am serious about knitting a pair. I've heard that two-at-a-time method is best because you can guarantee the pair come out the same. Or perhaps I should try baby socks next to speed up the time it takes to knit them. Wish I knew someone who was having a baby. I'm very excited about my future in socks. I'm really struggling with this sock. I've done the leg and completed the heel and heel turn and I'm now required to pick up the stitches necessary to start the gusset. I ask myself the "What-sset"? That's why I'm online right now; to see if there are any videos which might demonstrate in real time what the heck I'm supposed to do.